At the Drives & Controls exhibition in April, REO will be introducing an exciting new range of water cooled drive peripheral components. More and more Drive applications are utilising water as a cooling medium. In many instances the use of water allows drive enclosure sizes to be reduced and also allows higher ingress protection ratings for those challenging environments where protection of the Drive and the associated control gear is essential. Of course, in many of these applications there are requirements for braking resistors, chokes and RFI filters and in the past the considerable losses presented by these components have compromised the efficiency and success of the system as a whole. 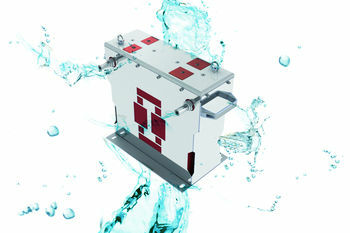 REO are now able to offer water cooling for all of its components, allowing up to 95% of the power losses in components such as input and output chokes and brake resistors to be transferred to the cooling medium, where it can be exchanged in a controlled manner or often be utilised in other aspects of the application, for example for carriage heating in railway traction applications. Water cooled components are up to 80% smaller than their air-cooled equivalents, this is important for automotive applications, but they also run considerably cooler, meaning that reliability and product life is greatly enhanced. As a safety measure, REO water cooled brake resistors are designed to run for 5 minutes at their rated power without any coolant to ensure the system can be safely shut down.